Time to indulge in some predictions. How will Fullers recuperate the lost revenue over the past 18 months from Waihekeans (Explore traitors and the faithful alike)? Let's assume an easy figure of 1,000 monthly pass holders in September 2014 at $355 (and no need for 'special' discounted fares) a pop. That's $355,000 a month. If Explore had not turned up, that would be around $6,400,000 revenue over the 18 months of competition. As Explore pinched around 25% market share, the revenue from monthly passes was 750 times $325 a month (the eternal "special" fare trumpeted in their media ads) totalling about $4,400,000. Roughly, Fullers lost $2,000,000 from Waiheke commuters alone when Explore was running. And that's not counting the doubling of its operating costs when Fullers doubled its number of sailings. Ballpark figures, of course, everything is commercially confidential as they never tire of telling us. You can adapt the amounts but it's certain a considerable sum. And mind you, this does not include the losses in market share in other tickets such as tourist single fares and multi-rides. On the plus side, Fullers enjoyed 100% of the super gold card cash, despite Explore carrying pensioners too, and was never obliged to share that loot until very late in the day. Fullers owes Winston Peters a big donation for that political help! For Fullers passengers who remained loyal there was only upside: extra sailings, discounted monthly passes making a saving for them of $400,000 ($30 x 750 x 18) that was able to be spent on Waiheke on other things. So how to recuperate the lost $2 million? The time frame for this should be about 6 months, because then the tourist season starts and commuters are just a nuisance taking up space on the boats that could be sold more profitably to tourists. Spread out over 1,000 monthly pass holders that means about $330 extra per month on top of the current monthly pass price. So expect $685 monthly pass fares ($355 - the discount no longer applies - plus $330). This can be mitigated by upping all other fares, of course, so the cost doesn't get borne by commuters only. You may have noticed crude oil prices have gone up recently. Fullers could spin this increase from $30 to $45 a barrel as a 50% increase that needs to be reflected in fares. They have done this effectively in the past anyway when the barrel price went to $250. That's half of the increase covered. The other half can be accounted for by spinning the costs of taking on 35 former Explore staff. Surely we will not begrudge those lovely boys employment and pay for them? The golden weather after 18 months of improvements in services on the Waiheke ferry has come to an abrupt end when Explore Ferries decided to pull the plug on its sailings from 8 May. It cited lack of patronage which would not enable them to get through the Winter. But this simple reason masks a multitude of systemic failures in the Auckland ferry scene, and if they are not remedied we will unlikely see any competing service ever again. This might suit Fullers' shareholders and cashflow very much, but it is an unsatisfactory state of affairs for passengers who can now only look forward to the resumption of the old service attitudes and upped fares. The public transport regulator, AT, is happy to look the other way because it cannot afford to offend Fullers, lest they would need to fund a ferry service themselves and that is the last thing they want to happen. - Explore was forced to dock at Pier 3 - while Pier 2 and Pier 4 were upgraded in no time (for the exclusive use of Fullers). - At all times AT inspectors were present at Pier 3 to see whether Explore staff made any mistakes. Any passenger reaction and complaints about the conditions Explore had to work under was immediately used as a stick to beat Explore with. 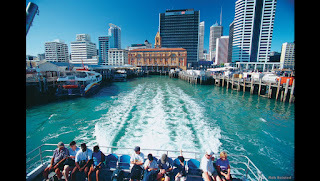 - The ticket booth was miles away from Pier 3 and at Matiatia better hidden than the toilets. - The exempt service let Fullers double its sailings at short notice and even when they could not meet their own timetable, nothing was or could be done to hold them accountable. - The extension of the supergold card loot was delayed for over a year, and when Explore offered passage for free in the meantime, nothing was done to make payment retroactive, i.e. make Fullers hand over part of the cash as they did not transport all pensioners as claimed between Auckland and Waiheke. - Preventing Explore from running a bus service on Waiheke, or even specifying in the Waiheke Bus contract all buses on Waiheke should meet all services, resulting in a useless service to and from Explore sailings (Fullers causing chaos for its own bus services after introducing a half hour service was left unexamined or cared about). It is now up to politicians at all levels to remedy this market failure and tackle this private monopoly head on with some urgency. The Local Board needs to lobby all players involved to ensure a satisfying outcome for islanders and visitors alike. City Councillors need to seriously look at the dysfunction, incompetence and obvious favouritism at Auckland Transport. National politicians need to abolish the 'exempt status' of Fullers and bring it under the umbrella of the PTOM system, so services can be regulated, in case it remains a monopoly, or tendered for, in case there are other companies interested in providing the service.